Tibet Telegraph: Self-immolations in Tibet: who is to blame for the stalemate? Self-immolations in Tibet: who is to blame for the stalemate? Although the number of self-immolations is rising at an exponential and very disturbing rate in Tibet, the crisis is gradually reaching a stalemate. With no change in the horizon and less attention being paid by foreign media and governments, more and more people outside Tibet are expressing doubts about the effectiveness of such protests and wondering whether precious lives are not being sacrificed in vain. Self-immolations could arguably be considered a failure if we think that they are primarily for foreign consumption. 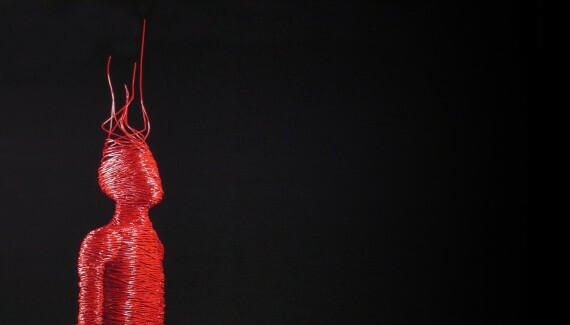 However, many elements tend to prove that this interpretation is painfully reductive: the eyes of the Tibetans inside Tibet may not be turned to Washington or Brussels, and it may well be that the response from the exiled Tibetan leadership is responsible for the deadly stalemate and directly influences the growing number — or any reduction — of self-immolations. I am convinced that the failure to make good use of the current crisis is the result of two factors: (1) an incorrect assessment of self-immolators’ objectives; and (2) a far too cautious reaction from the Tibetan Government-in-Exile. For most Tibetans abroad and their supporters, the general perception is that people in occupied Tibet set themselves on fire to urge the international community to speak out and condemn the ongoing repression in Tibet. This line of thinking, unsurprisingly, leads commentators to wonder why the self-immolation of Mohamed Bouazizi succeeded in bringing down the Tunisian regime whereas over seventy self-immolations in Tibet have not affected the world. And it is precisely by raising the case of 26-year-old Mohamed Bouazizi that the reply can be found: his self-immolation (only the first of many during the Arab Spring) did not in any way prompt foreign governments to support the Tunisian Revolution — the regime was an ally of most European capitals — but it captured the discontent and frustration of Tunisians, who left their fears behind and took to the streets to bravely stand up to their leaders. Tunisia is not alone: wherever self-immolations have taken place in this world, they primarily influenced the concerned masses, not foreign governments. Expecting world leaders to be moved and to act exclusively on the basis of the gruesome sacrifice of a large number of Tibetans is pure wishful thinking; as long as the stakes are not seriously raised by Tibetans abroad, no international intervention, nor even UN resolution, can be expected. But wondering why self-immolations in Tibet do not affect the world is also misreading self-immolators’ messages. Apart from Gudrub, the 43-year-old writer who set himself on fire in Nakchu on 4 October 2012 and who wrote “Just world, uphold the truth“, none of the self-immolators in occupied Tibet called, directly or indirectly, for foreign support — at least as far as we know. Since 1987, calls to the United Nations or to visiting diplomats have regularly been made from Tibet. This is not something unheard of. But this time, no one mentioned outside help. All the messages we are aware of are pleas for national unity. Their authors appeal to their compatriots to stand as proud Tibetans and work for the freedom of Tibet. These are calls to oppose and act against China’s tyranny, not to beg for foreign support. The second factor accountable for the current stalemate — and by far the most important — is the extremely cautious attitude adopted by Dharamshala. The reaction of a government ought to be proportional to the magnitude of a specific national crisis or disaster. Considering the extreme methods of protest used in Tibet and the harsh response by the Chinese regime, caution and defensiveness can hardly be appropriate. Nevertheless, flying in the face of basic common sense, Sangay’s government ordered the status quo on the Middle Way Approach to be maintained, a status quo that is alarming and, by any standard, criminal. Since the beginning of the crisis, Dharamshala has operated as if it were unaware of the true scope and domestic impact of the self-immolations. It conveniently pays little attention to calls for independence and obstinately persists in pursuing a policy that has failed to bring any result since its adoption more that thirty years ago. In this regard, it is highly ironical that Sangay’s government vows “to fulfill aspirations of Tibetans inside Tibet” while it actually tries by every means to negotiate an autonomy that visibly nobody wants. So much for the changes promised on the campaign trail. Even more absurd is that Dharamshala has not even tried to take advantage of the self-immolations crisis to review its strategy and raise the stakes with Beijing. If not on such an occasion as this, when will its policy be adjusted? Along the same lines as in 2008, when the attention of the entire world was turned towards China and the Olympics, and protests had erupted all over occupied Tibet – or more recently when the Dalai Lama’s special envoys resigned – the Tibetan Government-in-Exile has miserably failed to display the kind of leadership required in such circumstances. The time is ripe for change, but the Tibetan leadership persists in advocating reconciliation and, despite all evidence to the contrary, refuses to acknowledge that Beijing will not negotiate until it is forced to do so by some serious challenges. Unfortunately, Dharamshala’s stubbornness has a cost, and everything indicates that maintaining the status quo seems to have a significant influence on self-immolations. 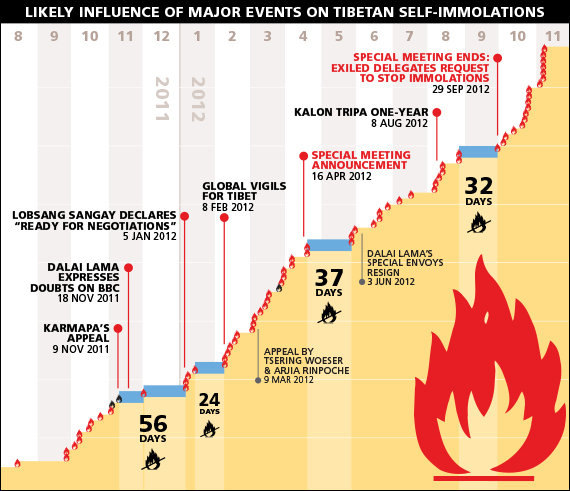 The graph below displays, in a cumulative way, a timeline of self-immolations since August 2011. For the purpose of this article, and to see whether there was any correlation, major events were plotted on the timeline. Although it is highly imprudent and unreliable to jump to conclusions from so little data, some striking parallels can be observed. Four major periods with no immolations (highlighted in blue on the graph) are noticeable since the beginning of the crisis: three of them lasted more than a month, the other lasted twenty-four days. Interestingly, these respites do not seem to be fortuitous: each can be linked to a particular event. 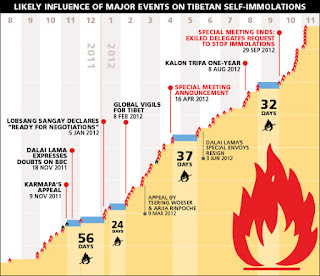 The first respite was from 11 November 2011 to 5 January 2012: in fifty-six days, only one self-immolation took place. It began two days after the Karmapa urged an end to immolations, an appeal that was soon followed by the Dalai Lama voicing doubts about these sacrifices on BBC. This respite also started just after two self-immolations were carried out abroad. It is not clear whether the appeals from the two religious leaders or the protests abroad had any influence, but no one set him or herself on fire in Tibet for the next eight weeks. (However, this autumn, the second appeal by the Karmapa had no effect on protests.) This period ended while the Kalachakra initiation was being given in Bodhgaya. Immolations resumed the day after Lobsang Sangay announced that Tibetans were “ready for negotiations anywhere, anytime”, with four cases in only nine days. The second respite, much shorter, occurred between January and February 2012 and lasted for only twenty-four days. No major event seems to have prompted it, but it ended brutally the day the Global Vigil for Tibet was launched, on 8 February. The third and fourth respites could very accurately be linked to the Second Special Meeting called in Dharamshala to “discuss ways to deal with the present crisis in Tibet”. The first of these two respites began on 20 April, three days after the meeting was officially announced. It ended the highest peak of self-immolations ever seen in Tibet: twenty-one cases in seventy-two days, and it lasted for thirty-seven days without a single immolation attempt. For unidentified reasons, self-immolations resumed during the Saga Dawa celebrations, on 27 May, although at a slower pace than previously. By the time the fourth respite occurred, ninety-three days later, sixteen Tibetans had set themselves on fire. The occurrence of the last respite is even more troubling. It stops with the conclusion of the special meeting, one day after more than four hundred Tibetans from twenty-six countries had appealed, in vain, to Tibetans inside Tibet not to take “drastic actions”. It seemed as if self-immolation protests had finally ceased towards the end of August, in anticipation of the outcome of the meeting, and then, as soon as it was clear that no policy shift was in store, they started again with even more intensity. In the month following the meeting, blatantly ignoring the call from the delegates, twelve self-immolations occurred in Tibet. Looking at the events of the last few days nothing seems to presage any decrease in the number of protests. In a nutshell, if this graph is to be believed, spikes in the number of self-immolations and periods of respite are directly influenced by the initiatives or lack of guidance from the exiled leadership. The more Dharamshala is prudent, the more self-immolations there are. No other events originally plotted on the graph showed any correlation with the timeline of protests, be it religious festivals, Lobsang Sangay’s visits abroad, parliament sessions, or foreign visitors in China (former US President Carter in December 2011). Viewed from any perspective, every immolation seems to be a direct response — or a loud signal, depending on your point of view — to the Tibetan leadership. What are we to conclude from all this? If appeals to stop self-immolations are ignored, if the primary objective of their authors is not about calling out to the international community and if, as the above chart tends to indicate, they reject the status quo as an option, the solution to the problem can only be found in a radical shift in Dharamshala’s strategy. Adding more casualties to the list of China’s wrongdoings and knocking at the door of foreign governments is definitely not enough. Nor is the “how-many-more-sacrifices-before-the-world-will act” attitude serving any purpose. When the “national drum” is being beaten loudly in Tibet, when “prime ministers” are called “kings” and when an “autonomous region” is called a “nation”, the time has come to change the rules of the game. The time has come for the Tibetan Government-in-Exile to declare the Middle Way Approach “no longer valid”, as the Dalai Lama did in 1992, and to resume active lobbying for the restoration of Tibetan independence. I am still convinced, every bit as much as I was ten months ago when I wrote my first piece on this tragic crisis, that a change of policy from Dharamshala is the key to putting an end to self-immolations. As far as I can see, the eyes of the self-immolators are turned towards Dharamshala, and not in the direction of Beijing, Washington or Brussels. When these men and women set themselves on fire, they are sending a signal to what they consider and value as their legitimate government. This signal is a call for action, a call for unity. And I am confident that they are patiently looking not for signs of sympathy or prayers, but for clear directions and leadership. The spike of immolations that happened right after the Second Special Meeting should serve as a lesson, and remind everyone that the time for passivity is over. As Gudrub wrote in justification of self-immolation protests, “Since China is uninterested in the well-being of the Tibetan people, we are sharpening our nonviolent movement”. Can’t Dharamshala do the same? Editor's NOTE-- Christophe Besuchet is a long time and staunch supporter of Tibetan independence movement, and the former publisher of Lungta magazine. He is currently the vice president of Swetzerland's Rangzen Alliance, and the above article is initially published on the official website of Rangzen Alliance - a group of Tibetan independence advocates.